This will be a quickie! A few weeks back, Kate came up from Geneva and we treated ourselves to a fancy, spendy afternoon drink (well, two) at the ParkHyattVendome. Several people have recommended that I visit this ParkHyattand I can see why. The staff are topnotch, the selection behind the bar impressive, the garnishes, ingredients and little extras are well thought out. There’s an extreme and impressive attention to detail here. My Beefeater 24/NP martini was excellent. I’ve lost my notes on this visit, which partly explains my delay in writing it. But, Kate’s cocktail was a sort of berry themed fizz. 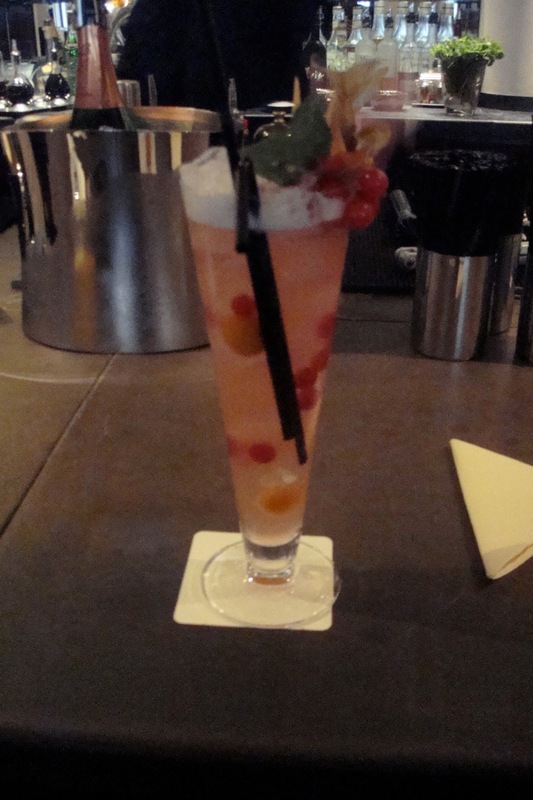 The barman took the time to stagger the ice and the fresh berries in the cocktail, so it was as pretty as it was tasty. Little trays of olives, cashews and macadamia nuts came with our drinks. Gleaming silver bar tools were lined up on the bar, along with fresh fruit and a nice selection of bitters. Their menu seems to be divided into a handful of house creations (which are riffs on classics), mojitos, daiquiris, martinis and classics. Prices were app roximately 25 Euros. While we sipped our 2nd drinks Evgeni Plushenko showed up with a lady friend and they drank mock-tails for a brief photo shoot at the bar. I’d be happy to go back and spend some time on the small sweet courtyard terrace as well. They also offer a cocktail class (for around a hefty 140 Euros) which I’m impressed enough by their drinks to sign up for. 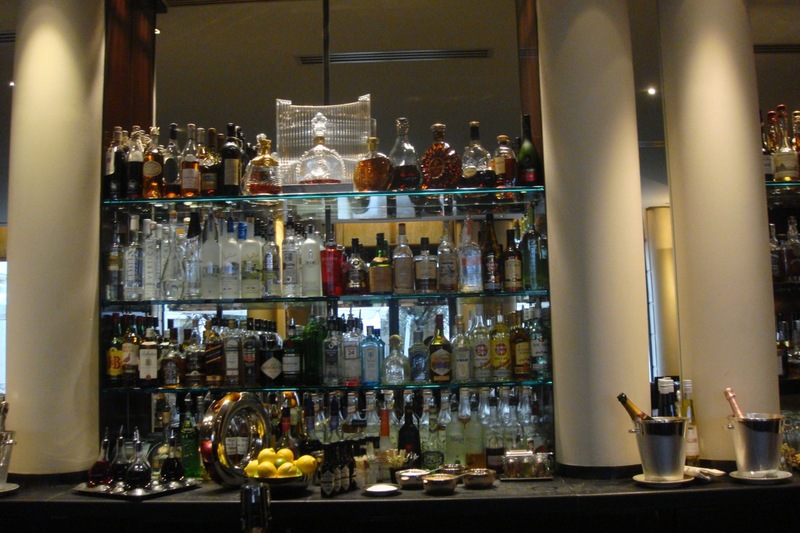 Overall, I love what they’re doing behind the bar here – but it ain’t cheap! 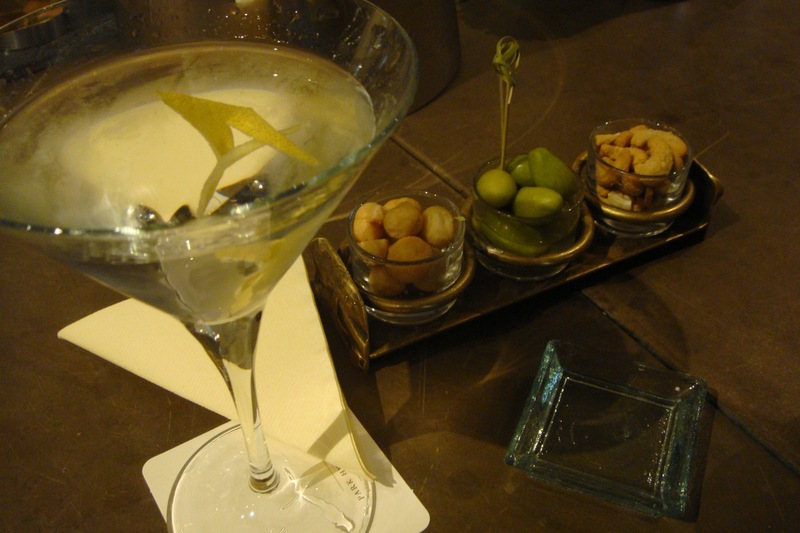 That looks like a decadent yet classic Martini! I like the way the accompaniments are presented. Could do with one right now! Columbine: I haven't tried the Intercontinental, but will put it on my list. There are a lot of good (and $$$) down there…so I've been thinking it would be nice to find out which one is the best in the 25 – 30 Euros price range so if you're goign to spend that kind of money, you know it's worth it. Gourmantic – thanks! and yes, I'm a bit of a sucker for cute little presentations of the munchies – and this was a nice presentation. Yes, my friend, I too am a sucker for those little munchies you are always getting and remain jealous. Mel … Ha ha! Clearly someone was slacking! In Edinburgh, with Cait. She's threatening to take me to the bar at the new Hotel Missoni. Would you like a guest blog entry? hope you and caitlin are having a fab weekend! if i ever did posts on bars outside of Paris, i'd take you up on that in a heartbeat! But, I will still look forward to a detailed report so i can live vicariously! have fun!! !